Rolex 1665 - Double red Sea-dweller, amazing condition. Fantastic piece. A 3 million Double red Sea-Dweller, with all the original papers and books. This watch has a beautiful patina dial with perfectly matching hands. The Rolex Ref. 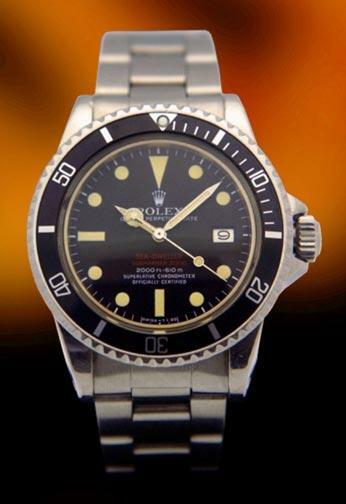 1665 was introduced in 1971 and remained in production until approximately 1980 (when it was modified and became Ref. 16660). The Ref. 1665 is interesting in that it is one of the only Rolex sports watches manufactured exclusively in stainless steel and was the largest vintage Rolex sports watch ever produced (as well as the only Rolex to be factory engraved on the caseback). It was equipped with a helium valve for divers and guaranteed safe to a depth of 2,000 feet. This example is in exceptional A++ overall condition with a mint stainless steel case, and comes on it's original stainless steel Rolex Oyster bracelet. Circa early 1970’s. This example should be the centerpiece of a fabulous collection of Rolex timepieces.